Sea Harrier FA4 2007-2020 "What-If"
This is my "What If" version of the SF2 Sea Harrier FRS.2 I helped update with Wrench and DTMDragon. Shortly before the paperwork scrapping the Sea Harrier FRS.2 was supposed to have been signed a Secret memo came from the US DOD claiming that its replacement,the F-35, was going to be much delayed, probably until 2015-2020. Rather than leave the Royal Navy toothless for a generation the decision was made to upgrade the Sea Harrier to FA4 status as a stop-gap until the F-35 was ready. As well as a new cockpit, strengthened wings, improved avionics including a new ECM jamming suite and a slightly upgraded Air to Air weapons suite the Navy now decided that it needed it's Aircraft to have a precision capability if was to play any part in any possible upcoming conflicts. By this point the technical boffins at the MOD had upgraded the RAFs precision strike armoury with some World Class munitions, which gave the Navy access to these new weapons allowing it to greatly expand the previously limited strike role of the Sea Harrier. The newly designated FA4 (Fighter/Attack) will lead the Fleet Air Arm of the Royal Navy into a bright future which makes the descision to scrap them look short-sighted. This has been designed to work on everything from any of the Stock Games (May '12 patched) including SF2:NA to a fully Modded install with NATO Fighters IV etc. The new weapons are standalone and will not affect other weapons packs, however you may see other weapons from your pack are available. Please use the ones labelled "Royal Navy/RAF (WEAPONS NAME)", they're all fairly grouped together for ease of use. 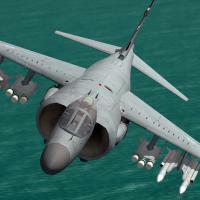 These have all been designed and/or modified for this Sea Harrier release specifically, even though the Weapons may seem to be identical to ones you already have and may include upgrades to my previous weapons packs. Unzip then copy and paste these folders into your Mod folder (usually C:\Users\YOUR NAME\Saved Games\ThirdWire\StrikeFighters2 or whatever yours is called). Sea Harrier FA4 (2007-2020) - Originally used by the Royal Navy primarily for Fleet defence this upgrade makes it a truly multirole weapons platform with a world leading capability. With it's immense power to weight ratio it accelerates/decelerates like a sports car and the new wing makes it 10G capable with a sustained 8G turn possible. If you want to add the 2 Belly AMRAAM's (Group 5) in place of the gun pods (Group 4) then you also have to add the Belly Pylons which are also in Group 4 and they will replace the Gun Pods. Sniper Pod - As this is the F-16 Chin Sniper pod in the loadout it shows up on the centreline but in-game it's where the right gun pod would be. The stock loadouts which require the Sniper pod also have the Left gunpod included which isn't possible through the In-Game Loadout Screen. There is a nice update in 2015 when the RAF Meteor Air to Air Missile becomes available. Refuel Probe - Sadly this was never skinned in the original model and with the new high resolution skins we now have it looked truly terrible and just didn't work so we've removed it until such time as a new one can be made and added via Fake-Pilot. Cockpit - There's no nozzle gauge and the Weapons locations on the Left MFD can be a bit glitchy. "GUEST" - Original SF1 release with Automatic Nozzles. DTMDragon - Various Ini Edits, Gun Pods/Belly Pylons & Manual Nozzles. Wrench - Various Ini Edits & Hangar/Loading Screens. ChrisBV - SKin and Decals. AmokFloo & AleDucat - Pilot and Seat. Ravenclaw007 - Once again for his fantastic weapons + Sniper Pod. IanH (me!) - Weapons Pack, Loadouts & Various Ini Edits.